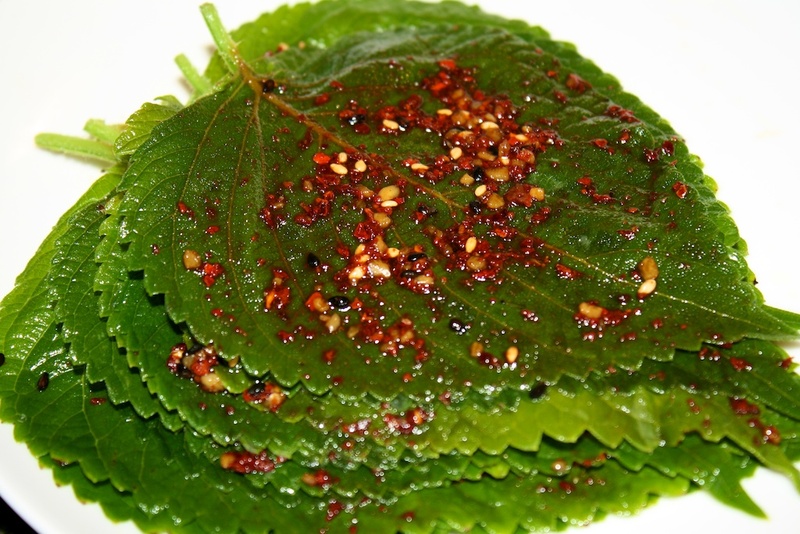 I thought I would share a quick and easy perilla leaf (kkaennip) kimchi recipe. As I explain in detail in my previous summer garden post, perilla is the easiest thing in the world to grow. If you plant a couple of stalks, you will have leaves from spring to very late fall. You never have to do anything for it! It’s like a weed! Since we have so much perilla, we use it almost everyday, for miso wraps, kimchi, namul, etc., which I want to share. The first recipe I will share is the kimchi recipe, since it’s Bill’s favorite! This is a very popular, staple Korean side dish. You don’t see it in the restaurants in the states too much, but the restaurants in Korea very often have this as a side dish. Perilla is super rich in iron, calcium and Vitamin A, C, and K. Korean cuisine uses it for kimchi, ssam (wraps) with bulgogi, salads, or make perrilla oil out of the seeds. Bill absolutely loves this kkaennip kimchi and asks me to keep a batch in the fridge at all times. 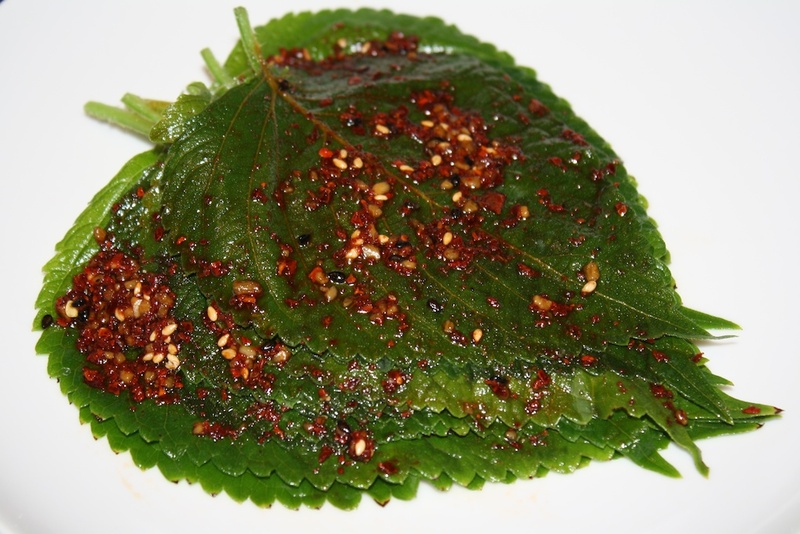 It has a salty, sweet taste that really accentuates the flavor of the perilla leaves. You can make this dish with raw leaves or blanched leaves. Blanching the kkaennip gives it a softer, chewier texture and a milder flavor. For those who find flavor perilla too minty or bitter, blanching it will dull the intensity. Bill really likes perilla (he immediately liked it), so he prefers not blanching it. This leaves it crispier and with a much more intense, spicy flavor. I like it blanched, as I did not like perilla initially. For people like me and Lu (one of our awesome readers) who think the minty-ness of perilla can be a little strong, blanching helps a lot. Try it both ways and see which you prefer! Most Korean grocery stores carry kkaennip, so you might want to try it out sometime. If it’s your first time, go with blanched leaves! 1. 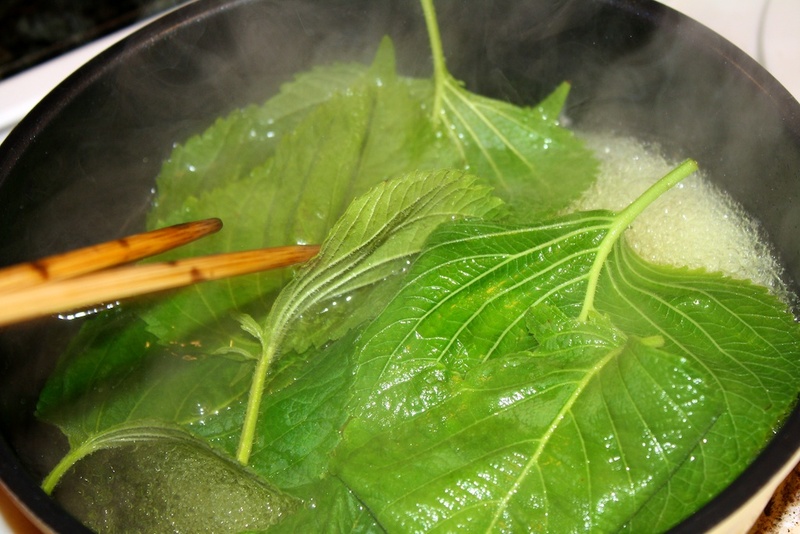 If are using raw just wash the perilla leaves and remove excess water. If you want to blanch the leaves, blanch for 5 seconds in boiling water so they turn greener in color and a little softer in texture. You do not want it too soft or too dark for this dish! 2. Add all the sauce ingredients. You should decide if you want more or less of any of these ingredients. Remember Korean cooking is all about shon-maht (hand taste)! Some people like to add some very thinly diced or sliced peppers, carrots, green onions, onions, etc. into the sauce as well. 3. 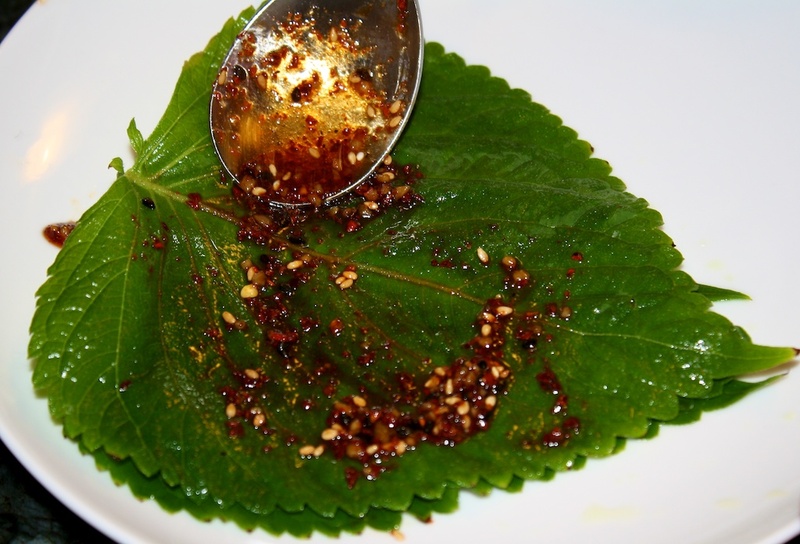 Using a spoon, spread the sauce over each perilla leaf and stack them in a glass container. Blanching the kkaennip for 5 seconds. Putting the sauce ingredients together! 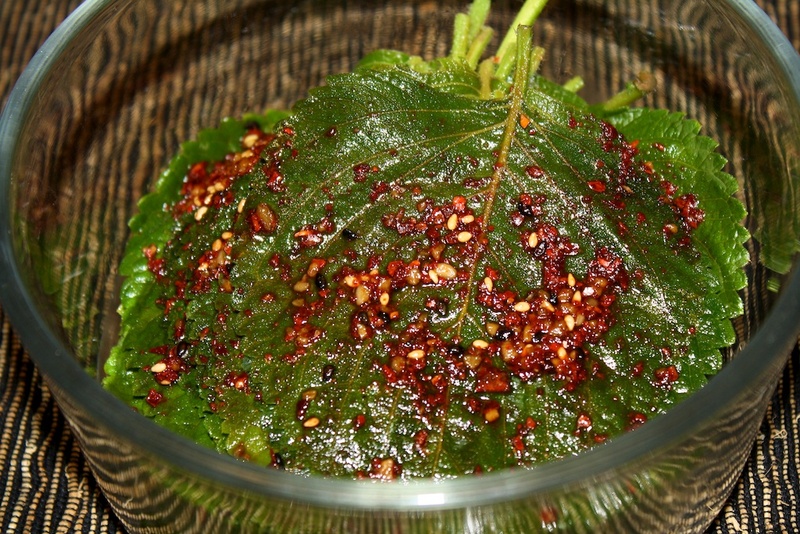 Spreading the sauce over each perilla leaf! 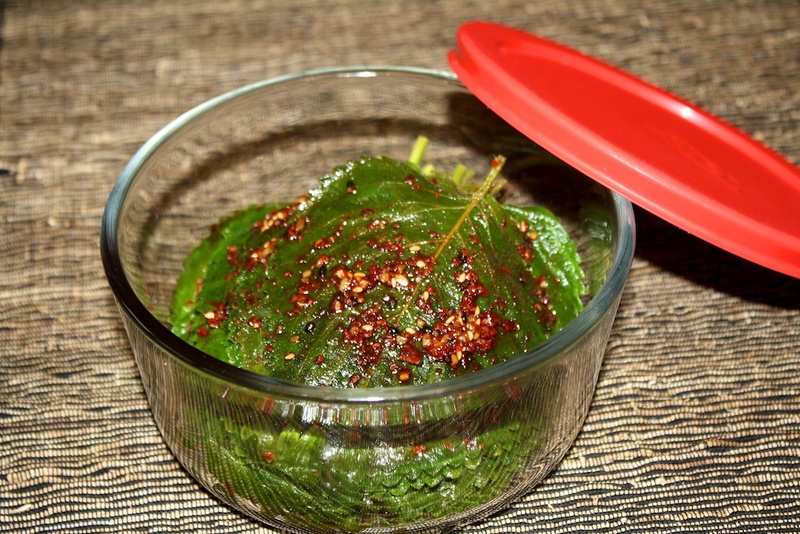 If you used raw leaves, you will need much less as a side dish as they have a strong flavor. If you used blanched leaves, you will end up eating more, as they will be mild and easy to eat! We Koreans like to make a bunch and store kkannip kimchi in glass containers so we can enjoy it for a while! So THAT’s what perilla is. I’ve seen perilla oil listed as an ingredient for various foods but didn’t know what plant they meant. I’ve had this in Korea, nice! Now there’s a name to match the taste. I’ll see if i can source a plant and grow some in Sydney weather. Yes, do try to grow some if you can find seeds, we are able to get seeds from one of our local Korean grocery stores, so I am sure you will be able to find some somewhere in Sydney. Once you plant it and let it sit through the winter, they will pop up in the spring every year! We also use perilla oil in our bibimbap for extra flavor. 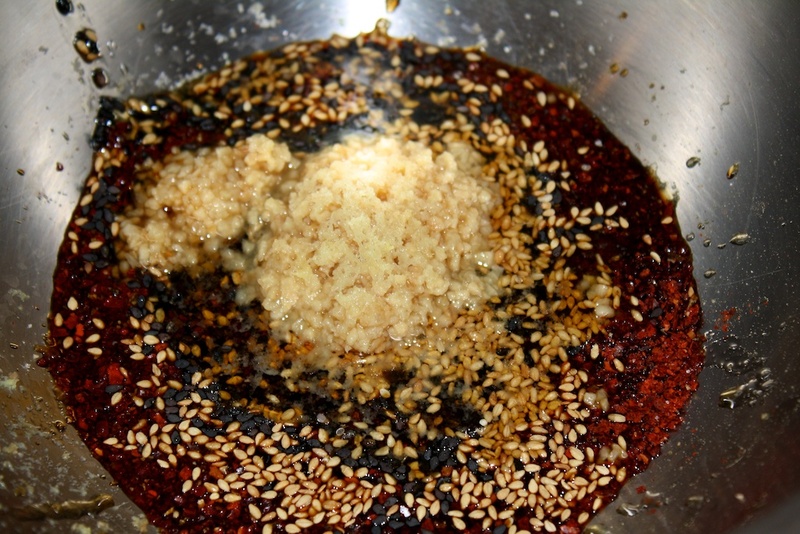 And some Koreans like to mix both perilla and sesame oil in their bibimbap. We’ll need to post about it sometime! Thanks for finding our blog! We hope you enjoy the recipes. 😉 Feel free to let us know if you have any questions as well. Thanks! quick question is there a taste difference between the perilla leaves that are purple on the underside and the ones that arent? Hi, Michelle. No there isn’t really. Most Korean stores carry both, and we’ve never noticed a difference. Thanks for visiting!